Comedian Stephen Colbert sends a video message to NASA on the eve of the shuttle Discovery's Aug. 25, 2009 launch to send his space treadmill to the International Space Station. CAPECANAVERAL, Fla. - Comedian Stephen Colbert is go for the space shuttleDiscovery?s Tuesday launch, even if he can?t watch the spacecraft send atreadmill named after him into orbit with his own two eyes. NASAinvited Colbert, host of Comedy Central?s ?The Colbert Report,? to watchDiscovery?s launch at 1:36 a.m. EDT (0536 GMT), but the comedian was unableto attend. Instead, he sent NASA a recorded video message urging astronauts totake advantage of the new COLBERT treadmill that is carrying his name to theInternational Space Station. 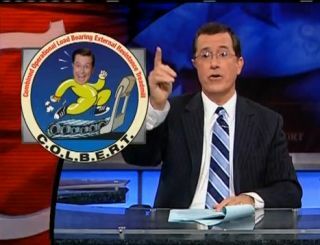 NASA namedthe treadmill COLBERT, short for the lengthy moniker Combined Operational LoadBearing External Resistance Treadmill, earlier this year after the comedian wonan online poll to name a new space station room after him. NASA opted to namethe new module Tranquility, after the Apollo 11 moon base, instead. But as aconsolation, Colbert got his name - and face - ona new treadmill for the space station?s gym. WhileColbert lamented losing the space station room, he took some solace knowingthat his treadmill will help keep flabbyastronauts healthy. ?Let?s faceit, being weightless is mostly just a desperate bid to get away from thebathroom scale every morning,? he said. In hisvideo message, Colbert told NASA?s spaceflyers to lay off the astronaut icecream and to stretch before using the COLBERT treadmill ?because in space no onecan hear you pull a hammy.? He closed withone final message to NASA: "Now this is Stephen Colbert saying, I am go to launch me. Let?s light this candle!? Discoveryis poised to launch on a13-day mission to the International Space Station, where itsseven-astronaut crew will deliver the COLBERT treadmill along with more than 7tons of other cargo. Three spacewalks and a one-astronaut crew change for thestation?s six-person crew are also planned. Discoveryhas an 80 percent chance of good launch weather and is now fully fueled for itspredawn Tuesday launch. Clickhere to watch Colbert?s video message on collectSPACE.com, a SPACE.compartner. SPACE.comwill provide complete coverage of Discovery's STS-128 mission to theInternational Space Station with Managing Editor Tariq Malik in Cape Canaveral,Fla., and Staff Writer Clara Moskowitz. Click here for shuttle missionupdates and a link to NASA TV.